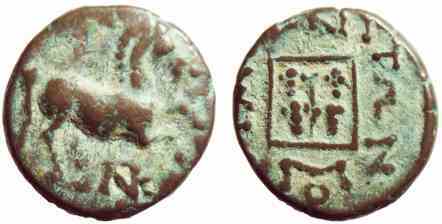 Bronze AE13, 13mm, 2.2gm, issued c. 400-350 BC. Rev: [MAP]ΩNITΩN, Linear square containing vine, monogram beneath. References: Sear 1636, SNG Cop 630. The horse on the obverse appears to be the badge of this city state. The vines on the reverse symbolise Dionynosis Maron and the famous wines of the region.